The functionality of the Smart Translation Solution integrates seamlessly into the WoodWing Enterprise workflow. Users will not notice that they are working with a third-party-solution. Unlike other translation solutions for InDesign and InCopy, who always prepare the entire document for translation, Smart Translation Solution supports the translation of distinct Woodwing Enterprise articles. Avoids the annoying task to create all components of an article again for a target language (copy all boxes, apply proper editions and language settings and assign a new article). We do not just export text from the articles – we know about any format change within the text and create segments to preserve typography and ease translation tasks (adjust to document types / customer needs). 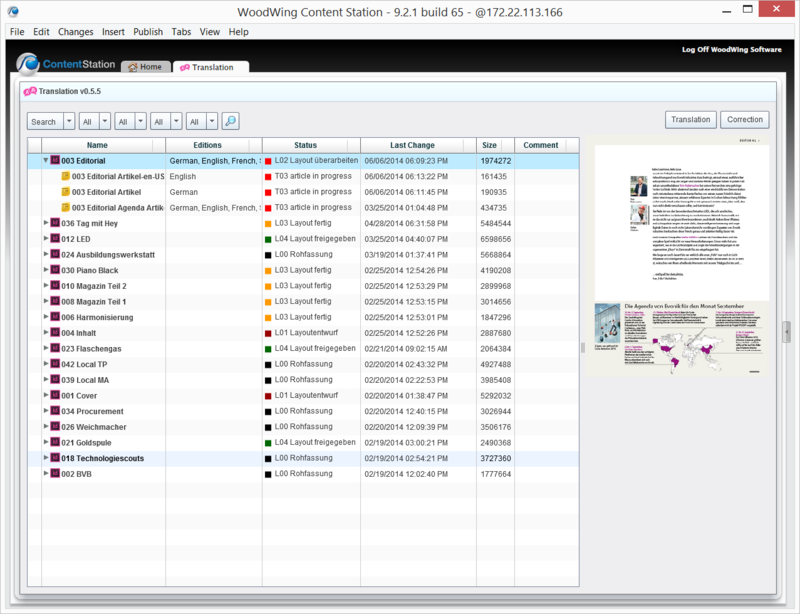 An optionally available module for the WoodWing Content Station allows the translator to do the job completely within the Content Station or export / import XLIFF to their preferred translation memory system – and see the resulting layout within seconds rendered by the InDesign-Server. With the module for the Content Station translators can perform their job direct within ContentStation — without lengthy training. This adds to the security of sensible data as in this procedure the translation file never leaves WoodWing Enterprise. Translations can be performed either by importing the XLIFF-file into an external translation solution like SDL Trados or with the optional Content Station Module. XLIFF-files can be generated either locally with an InDesign / InCopy client or centrally on an InDesign-Server. When new translation jobs are created in WoodWing Enterprise the translator assigned to this job is notified automatically by E-Mail. Smart Translation Solution uses XLIFF, the standard in the translation industry, to im- or export files. Works with all major TMS (translation memory systems) like SDL Trados, memoQ etc. All established translation solutions are supported so that the translator can continue using his preferred tool. All formatting within a translation job are maintained during translation and re-import into InDesign. Post-processing is not necessary. The layer functionality in InDesign is fully supported so that translations can be placed on separate layers.